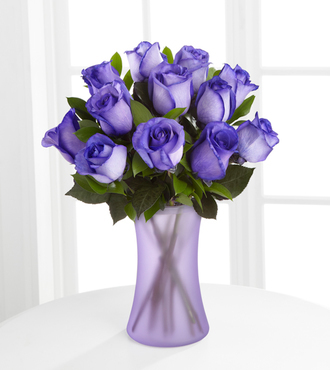 The Popping Purple Fiesta Rose Bouquet is a burst of vibrant color that adds that extra special touch to any occasion! A dozen stems of bright purple-dyed roses offer a fresh look of intense color, seated in a purple glass vase, to create a unique bouquet that turns any celebration into an extraordinary time. Approximately 19"H x 14"W.